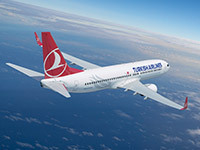 The national airline of Turkey, Istanbul based Turkish Airlines, recently released its latest stats for the month of August which showed the airline scored its biggest ever load factor in its history with 85.6%. Some of the key results for August 2018 included the news that the airline carried some 7.6 million passengers, up by around 2.4% over the same month last year. Total Load Factor improved by 1.3%, with a minimal increase of 0.5% in capacity (Available Seat Kilometre), while international load factor increased to 85.3%, domestically the carrier took the loads to 87.6%. In August, Africa, Far East, Domestic Lines and N. America showed load factor growth of 3.1 points, 2.3 points, 2.2 points and 2.1 points, respectively. Cargo and mail volume continued the double digit growth trend and increased by 21%, compared to the same period of 2017. Main contributors to the growth in cargo/mail volume, are N. America with 32% increase, Europe with 24% increase, Far East with 22% increase and Middle East with 18% increase. 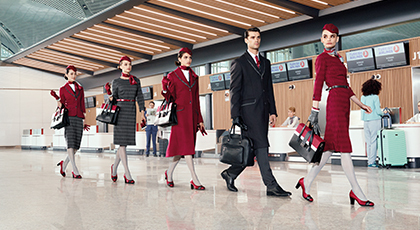 Read on for details of Turkish Airlines new stylish fresh uniforms. The rapidly expanding carrier also unveiled a new fresh uniform to help celebrate 85 successful years of operations. The new uniforms have been inspired by many classic elements of Turkish design and culture and the new uniforms incorporate traditional patterns found in artisanal glassware, ceramics and calligraphy. The collection combines shapes and colours found in Istanbul Bosphorus with a new ‘flow detail’, created to symbolise the effortless and dynamic energy flowing through Turkey’s most dynamic city as an intersection between East and West.